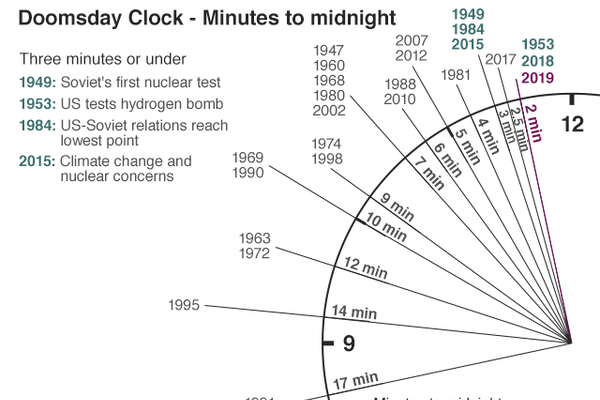 Why is the Doomsday Clock Set at 2 Minutes to Midnight? Ever since the U.S. atomic bombings of Japanese cities in August 1945, a specter has haunted the world―the specter of nuclear annihilation. The latest report from the Bulletin of the Atomic Scientists, issued on January 24, reminds us that the prospect of nuclear catastrophe remains all too real. Citing the extraordinary danger of nuclear disaster, the editors and the distinguished panel of experts upon whom they relied reset their famous “Doomsday Clock” at two minutes to midnight. Furthermore, while nuclear arms control and disarmament agreements crumble, a major nuclear weapons buildup is underway by all nine nuclear powers. The U.S. government alone has embarked on an extensive “modernization” of its entire nuclear weapons complex, designed to provide new, improved nuclear weapons and upgraded or new facilities for their production. The cost to U.S. taxpayers has been estimated to run somewhere between $1.2 trillionand $2 trillion. For his part, Russian President Vladimir Putin used his televised 2018 State of the Union address to laud his own nation’s advances in nuclear weaponry. Highlighting a successful test of Russia’s RS-28 Sarmat intercontinental ballistic missile with a payload of 15 nuclear warheads, he also boasted of developing a working laser weapon, a hypersonic missile, and a cruise missile powered by a nuclear reactor that could fly indefinitely. Putin noted that the hypersonic missile, called Kinzhal(or dagger), could maneuver while traveling at more than ten times the speed of sound, and was “guaranteed to overcome all existing . . . anti-missile systems” and deliver a nuclear strike. The cruise missile, displayed on video by Putin in animated form, was shown as circumventing U.S. air defenses and heading for the California coast. Even so, all is not lost. Leading Democrats―including presidential hopefuls―have demanded that Trump keep the United States within the INF Treaty and scrap plans to expand the U.S. nuclear arsenal. Adam Smith, the new chair of the House Armed Services Committee, has called for “a nuclear weapons policy that reduces the number of weapons and reduces the likelihood of anysort of nuclear conflict.” Using their control of the House of Representatives, Democrats could block funding for the administration’s nuclear weapons programs. And with enough public pressure, they might do that.